This view of Uravan, Colorado from the 1980s is from the website Uravan.com which is a tribute to this historic town. My wife and I recently returned from a trip to visit her mother, Irma Fitzpatrick Harrington in Elko, Nevada. Irma provided us a copy of this manuscript entitled "Uravan" written by her mother, Vesta Price Fitzpatrick. 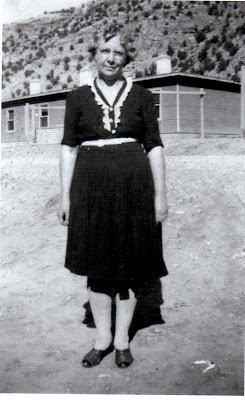 Irma has talked many times over the years about her experience living in Uravan during World War II. It was a time of innocence when children were allowed to play on hills of radioactive mine tailings. Concerns about radioactivity at the dawn of the twenty-first century led to the town of Uravan being declared a Superfund site. Most of the town has been demolished and buried. Certainly Vesta had no doubts about the significance of her family members' roles in the war effort. She was proud of her sons and sons-in-law that wore U.S. military uniforms and she would do whatever it took to bring them home safely. She had no doubts that the atomic bombs dropped on Hiroshima and Nagasaki brought them all home sooner and safer. She was also proud of her family on the home front that did their part to support the development of the atomic bomb. The typescript is 143 pages of double-spaced text from a typewriter. I have attempted to present the text as close to the original as possible with minor editing described in footnotes. If you would like to receive a copy of the scanned PDF of the original typescript, please contact me. This first installment represents the first seven pages of the typescript. With Memorial Day approaching, it is most appropriate to honor the contributions of all of those who lived and died during World War II. My plan is to share this manuscript with as many readers as possible by publishing it here on my blog. My hope is that the descendants of Vesta Price Fitzpatrick can take great pride in their ancestor and her amazing literary achievements. In addition to this memoir, Vesta Price Fitzpatrick is the author of dozens of short stories and poems. The author of this manuscript, Vesta Price Fitzpatrick, comes to you with this her first-born in the literary world. It is perhaps her first-born in the literary world, because of her other children, seven in all, who so completely filled all the hours of the days and nights when her brilliant mind was collecting and saving all the little gems of wisdom and human understanding offered herein. I don't need to tell you that in spite of bucking this tough old world all these years, she has come through with a rare sense of humor and kindness. Always, she sees only the best in everyone, even those in whom I am so often convinced that there is no "best". She really can't help it that all the 'parasites of the world' look like good, loyal Americans pitching in to win a war and protect their country. Vesta Fitzpatrick has recorded in this book the war, as it looked from where she stood, and as I am sure it looked to many defense workers and anxious mothers, fathers; wives and sweethearts. When you have finished reading this manuscript, lay it gently down, for it is part of the life and soul of the most innocent, the, best and sweetest woman in the world. You see, I am amply qualified to say all this. She is my mother. In this book I have endeavored to portray the life of a mining camp of busy people working for the defense of our country in wartime and building unity for peace of all countries; to depict a view of the real west of today, arid as it was when uranium was being mined and processed for the atomic bomb that ended the war. With apologies to authorities on the English language, I have tried to put a touch of the west into the story to maintain its traditions and give the world a glimpse of the grandeur of its wide open spaces and good people. Except for a few who have given consent for the use of their names, the characters are purely fictitious. Not much is left of Uravan today, this view from the 2000s shows the two remaining buildings. Go to Uravan.com to see more pictures and read the history of this town that played such an important part in the Manhattan project. Vanadium, uranium, Uravan. Uravan? Who ever heard of such a place? But it is becoming known all over the world. In the years to come Uravan, Colorado, will stand out before the world as a great, grand monument to Peace-- Peace, for humanity. The greatest, fiercest, most devastating explosion the world has ever known wiping out two whole cities, taking Nagasaki and Hiroshima off the map, is the very same explosion which put Uravan on the map, figuratively speaking, and made a little mining camp famous. Away in the wilds of the Great American Desert, nestled deeply within the high rock and jagged cliffs of the Rocky Mountains in Montrose County, Colorado, is the little secluded mining camp of which we speak, located on the very banks of the San Miguel River. At various times of the year the San Miguel is a mad rushing torrent of mud and debris from the mountains, claiming a life now and then, and at other times affording a delightfully refreshing place for picnickers and fishermen; but never failing to give for the necessary power and water need to keep a big industry alive. And indeed, a big industry it is that yielded the precious metals which made it possible for firing to cease and for our service boys to start home. When all America joined hands in the big common cause to whip the enemy and preserve our democratic way of life for the world, none of us knew just whom we were joining hands with, nor did we care. Our most despised neighbor had sent his son or daughter. Our most ignorant and lowly acquaintance had rolled up his sleeves, spit on his hands, grabbed a pick or shovel or whatever he needed to do his part in the big struggle to get his boy and ours home safely, forever. So, where be the man, woman or child not big enough to brush off petty grievances and join hands? Certainly not in Colorado. For in this state all men were created equal, and as the progress of a mighty nation moves forth in united efforts, just so in Colorado—that united wee part of the nation we love and cherish. And still smaller, almost as small as the atom itself as compared to the world, is Uravan. Nevertheless her power is not to be compared with anything. It was from the very hills, that surround the little mining camp of Uravan, that the uranium ore was taken from which the famous Curies discovered radium. These same hills of sand rock gave the priceless metal for the atomic bomb. One very early July morning before the sun had dared to peep over the yet snow tipped Grand Mesa and while it was still cool enough for a wrap, which I had left at home, found me at the bus station looking around for the San Miguel bus. I intended to take that bus for Uravan where my men folk had gone to work. Until then I had not felt a part of the big war. It was all so awful, sending sons and sons-in-law off to foreign soils and just seemingly doing nothing myself. But as I fully realized that I was soon to be in defense work, I felt big and important. As I waited in the station, large busses roared in and out from either direction, but they were not for me. When the San Miguel bus rattled in, I’ll have to admit I lost a lot of my pent up importance. I could hardly believe my eyes. Until that time I had never seen anything like that this side of the dump grounds. However, in so speaking, I hold a grand respect and admiration for the transportation company and its drivers who struggled so faithfully over those long dusty mountain trails, successfully transporting supplies and people to and from the railroad centers to the most isolated yet most important little places in this part of the world. The bus was a battered up mess of steel with some spots of yellow paint still clinging here and there and with at least one window glass left unbroken and still in place. The big tires on the wheels were apparently in splendid condition and I learned later that was the all important thing--the tires tor the roads we were about to tackle. I must have presented a funny spectacle to my bus companions with my new permanent wave, my pretty black dress with crisp white collar and cuffs, dainty little one-ear hat cocked coyly over my curls, white gloves and high heeled pumps. I felt very much dressed up--when I started on my journey to Uravan. The bus was one of those accommodation affairs with space for the baggage in the rear directly behind the seats. The baggage consisted mostly of bed rolls—a half dozen of them, some suit cases, boxes of groceries, packages, two large spare tires and a crated alley dog puppy. There were nine passengers. One middle aged woman who had a big sore on one cheek and an eye that was drawn to one side by a new scar, sat down by me and enlightened me with the fact that she was returning home to Nucla after being away to Denver. She had been receiving treatment for injuries suffered in a car wreck. The car had gone over a high embankment on that very road and she would show me the exact place when we got to it. "Oh! It is a terrible bad place" and she hoped our bus driver knew his business or "we will never make the turn with this old wreck," she explained. Her dress was a very plain grey suit that had probably been her wedding outfit at least thirty years before, with tennis shoes and a brown bandana tied over her head. Two young women took the seat directly behind, the driver and after giving me a "once over" look, one said to the other, “Wonder where that came from? She sure don't know where she's headed for or she wouldn't put on them glad gay rags. She'll learn." The woman by me laughed heartily and said to me, "You city folk don't know much do ya, about these mountain roads." The audacity! I was no "city folk" and certainly not an easterner. I was just a plain Colorado native, a farmer's wife and the mother of seven children, all nearly grown by this time. Nevertheless, I had been taught always to look my best at all times and I certainly had not reckoned with the sort of trip I was experiencing. The girls were dressed in Levis and plaid shirts with bandanas on their heads—very sensible garb as I was to learn. The other passengers were men all in work clothes--men that one might meet in any place where work is all that is uppermost in the mind. These men were not different and yet each was a distinctive individual. All had but one thought; the idea of defense work, licking the Japs and Germans so that the Joes and the Bobs and the Bills could get back. And if they didn't? Their teeth clenched down harder and their faces took on an even more determined look of vengeance. They were determined to win the war with just their muscle and brawn alone and buy bonds for Uncle Sam. Conversation among them ran in this channel: each telling of his son or brother or other relative in the armed forces and each with a nasty word for the so-and-so who turned him down and wouldn't let him carry a gun or fire a cannon. "Why, dad-gummit,” two or three fingers off or a short leg or being, past sIxty-five wouldn't keep them from being good soldiers. But they guessed someone had to stay at home and do the little jobs on the home front. The girls were going back to their jobs at the boarding house. They had been to town to shop but, for the life of me, I couldn't see, anything they had purchased. However, as time went on, they talked of shopping for dresses and, believe it or not, one produced from her huge purse an envelope that contained a beautiful rose pink silk, knee-length frock. What a laugh! No one in the world could picture that "dame of the desert" in anything half so beautiful or feminine like--but time would tell. The time would come, the occasion arise when she and others of the little mining camp would stand out, as fairies in their gay colors and ruffled finery. But back to my journey. By eight a.m. we were rolling along over a smooth oiled highway. Early morning breezes wafted in through the open windows and bore the lovely fragrance of roadside flowers and fields of new mown hay. I was receiving the impression of there being real pleasure in bus trips when, all at once, a right turn in the road threw me up into the air, off the seat and all but landing me into the aisle in a heap. By now I had begun to realize how very much out of place my garb was for that trip. The four inch crack in the door together with the open windows, or rather pane-less windows, was letting in clouds of white dust. My pretty white collar was beginning to wilt down—like a snow ball in summer--under the strain of the hot air borne in with the dust that was turning my pretty black dress to an ugly grey. I had given up trying to keep my hat on my head. But neither would it stay in the seat beside me, so I was forced to hold it with one hand and my purse with the other. It took only a short distance over that road to make me know that I had to hold on with all the force I could muster from both hands and both feet or else I would be on the floor jolting around with the junk that was heaving and sliding from the back of the bus up under our feet as we climbed the Nine-mile Hill. And nine miles it is. But the longest nine miles anyone ever traveled. That was the old road. A construction company was busy then building a new road down the canyon that would out off considerable distance as well as eliminate the steep climb. The conditions were terrible but the crowd on the bus was jovial. I was game. I had to be. Very soon I accepted the crowd as the well-meaning people they were and listened to the interesting tales they told of the various places and things along the way. Well up in the Unaweep Canyon is the skeleton of an old stone house, a once beautiful structure from all appearances. An old legend has it that a wealthy young Englishman once owned it and had established a dude ranch there where he lived in luxury with a valet. These two people disappeared. So the 'story ends. Nevertheless, it affords much food for interesting tales of wandering imaginations. My seat companion had moved to another seat and as we came to a somewhat smoother piece of road, had dozed off to sleep. Likewise the howling little puppy in the crate became quiet and slept after his master, Charlie, had given him a meal of warm milk from a thermos bottle. Charlie talked. In fact, he, talked most of the time-- if not to the pup then to most anyone or no one in particular--just rattled on. He had prospected most of the hills in that part of the country for gold in the earlier days and was still gold crazy. But the new black carnotite metal was luring him at this time. He talked on "I don't know what all they do with vanadium besides hardening steel but they say they get radium out of uranium and what Uncle Sam wants with it, only God knows, but if Uncle Same wants it, we'll get it for him. Does look like he could wait till the war's over and let us guys all have jobs in the ship yards or somewhere where we could do some good, but he thinks he needs this stuff so we'l. get it mined. Yonder is a big vanadium vein. Watch up that gulch for the mine dumps." Despite the rough roads, the heat, the wind, all the discomforts, I was thrilled when I got my first glance at a vanadium mill at Gateway. We were passing through some of the most beautiful country in the Rocky Mountains. We had climbed over three thousand feet up the mountains through the fertile valley and low table lands where cattle and sheep are plentiful, over the divide and were going downhill and up, it seemed, at the same time. Spelling of San Miguel was corrected from original manuscript. Carnotite is a potassium uranium vanadate radioactive mineral with chemical formula: K2(UO2)2(VO4) 2· 3H2O. The water content can vary and small amounts of calcium, barium, magnesium, iron, and sodium are often present.